I am sure that having read the guild name, some of you are hearing the Beastie Boys’ song “No Sleep Till Brooklyn” playing in your mind (if you never have heard the song, go check it out on Youtube). That song is about the journey of the band making the most out of every moment and not about a destination. The guild, No Sleep Till Kessel, believes in this, in fact it is part of their mission statement. Too many times we all get caught up in this instant information…heck, instant everything society, that we lose sight of the journey. Now just because they like to take in the scenery as they progress in SWTOR, does not mean they are not able to clear Flashpoints, Operations and looking forward to Ranked Warzones in Patch 1.3. How did NSTK get started and was it created just for SWTOR? How did music play into the naming of the guild? NSTK was formed via twitter/social media almost one year ago. I had many issues finding guilds that were community focused while playing in WoW. Some were raiding only, some were just social, and I knew there had to be a way to balance the 2 without sacrificing one or the other. I tried running guilds in WoW and in Star Wars Galaxies, but never had the chance to really create a community. NSTK came together by me and a few others in the effort to do such a thing. Naming wise, we were brainstorming some fun ideas that weren’t your generic sounding guilds or some random Latin phrase. We started talking song names and started putting Star Wars related items in the title and this one stuck. @Linedan on twitter came up with it and I think it’s brilliant! Normally we ask what server you all are on and it is a simple question, but NSTK just has made the move to a new server. How has the process been, so far? What has been the hardest part of the transfer? What has been the best part of the move so far? We moved from Juyo(PVE East) to Canderous Ordo. The move, for the most part, has been incredibly smooth. Members were very open to transferring servers and only a few folks were lost on Thursday when the transfers went live. For us, the hardest part is seeing our long time, preguild members and folks from early access lose their Character and Legacy names, but most understand that the payoff to higher populated servers is good. 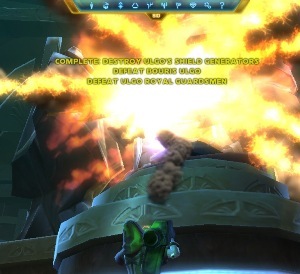 Additionally, we still have not had our guild bank set up by SWTOR CS after almost 5 days, it’s a little frustrating. What faction is NSTK playing? Are there plans for a Sith division of the guild for Legacy benefits? NSTK is a Republic guild, however we had a sister guild on Juyo that we placed our Imperial alts in (and they placed their republic in ours). However, their guild somewhat died off and we are looking for a new guild to ally with on Canderous Ordo. It is a delicate process because we don’t want to ally with a guild that doesn’t match our ideals and motivations in game, so we are taking our time. Folks like me in NSTK love Bioware story and want to see all 8 class stories and both faction stories. Time will tell how it all shakes out! If any Imperial guilds on Canderous Ordo are interested, let me know! As the guild leader you have to help steer your guild to better itself and give officers and members tools to do so. Do you feel BioWare has given guilds tools to help with this? Do you see areas that BioWare can improve on tools for guilds or even just players in general? I feel that guild tools are one of the biggest issues we have in game right now. There are no incentives for people to be in a guild and guild management is kind of a headache. While I understand that SWTOR could not launch with all the guild features other games have, I think that the guild features in SWTOR are probably the lowest of any MMO on the market right now. No guild progression, guild perks, guild banks are in, but somewhat archaic to use. Guild leadership tools are pretty weak as well. No way to distinguish active accounts from active characters, no way to track who leaves/joins a guild outside of when it actually happens, no calendar, “tabard” or logo system, etc. This is a major sticking point for me as a GM. NSTK is a PVE server guild. What style would you say your guild falls into? We are a community first, guild second. We are folks who want to spend time playing and discussing SWTOR together. We have 2 operations teams who have cleared HM’s of both EV and KP on 16 and 8 man and are now working through HM’s of Denova. Both are VERY dedicated. Once 1.3 launches we will be starting organized PVP and Ranked Warzone teams as well. We like to dabble in everything. NSTK has a whole thread just for Contests/Events. Who is in-charge of event planning or is done by committee, etc.? What type of events does NSTK participate in and what ones is the guild getting ready for in the upcoming months? Events can be planned/organized and ran by anyone in the guild. Most are officer ran, but there have been members who have organized many events as well. We have done scavenger hunts, world boss groups, Datacron events and are planning an “Amazing Race” event to celebrate our 1 year anniversary as a guild next month. The guild has a simple loot system. Has this been hard to enforce, knowing most gamers think in some way that rare loot is always “needed?” Has player companions added to the loot issues that happen in MMOs? We have had no issue with loot distribution as I am aware of. We make it very clear at the beginning of both ops groups that we aren’t here to get you the best in slot items or gear out every character. We are here to enjoy the content and progress our characters. Our members have been very helpful with this system, many times passing loot to people they know who needs it. I’m a big proponent of less heavy handed management and more community steering. If you foster a community with a sense of respect and helpful attitudes, you won’t have to make strict loot rules. We call it the “no douchebag” rule for a lack of a better term, but it really carries over. Pay it forward, people know that they will eventually get items and it all balances out. Was NSTK surprised by the announced new things coming to the game this coming year at E3? What is the most surprising or something the guild members seem excited about? I don’t think we were surprised at new announcements, but are definitely excited. There has been a lot of interest in HK 51 and the new operation, but I think our members are just happy to see new content coming in whatever form it comes in. We are happy playing the game now and everything that comes next is gravy. Are there things we would like to see? Sure. But we know that MMO’s take a lot of development time and are happy with what we have right now. The group finder coming in 1.3 will be a HUGE help for members who need help with flashpoints and world content. It will also help our ops teams out when/if they are ever short a player or two in 8 man situations! Personally, I’m most excited to see what they end up doing with guild progression and guild capitol ships as they discussed at the guild summit. I think this could be a pretty cool set of features! The guild’s mission statement mentions how it is the journey and not the destination. Can you share what this means to you and even NSTK? Do you think this concept has been lost in the MMO genre over the last few years? Has BioWare done a better job of trying to put the focus on the journey and not the destination, in your opinion? 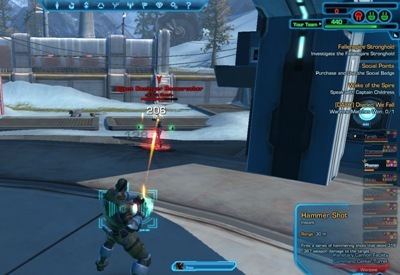 Making the level up game the focus of SWTOR has definitely done that from the perspective of BioWare. I think that there needs to be enhanced focus on endgame content for the “second phase” of character development. I see a lot of my members leveling to 50 and then saying that there is nothing to do and then level a new alt. That’s good that they don’t quit the game, but bad that they don’t feel there is much/anything to do at 50 outside of the same boring loot/daily/pvp grinds that many members got tired of from previous MMO’s. We focus on the people and building relationships with each other, while it sounds corny, ask anyone who has been in a guild for a long time why they stay, and it’s that journey of getting to know folks, building friendships and relationships(good and bad!) that keeps them interested. There are thousands of guilds out there for people to join. We want to be the top destination for folks looking to join a SWTOR fan community. Things are very hectic with the transfer happening so recently, but is NSTK recruiting currently or is the guild going to “catch its breath” from the move? If the guild is recruiting are there specific classes/advance classes or roles the guild needs? We are always open to new members joining. We don’t “recruit” per se, we let folks apply if they are interested in our mission statement/charter/etc and we do a lot of friend of a friend or word of mouth recruiting. We love to have couples, families, etc in the guild. It has worked very well for us so far and we will continue to use this method as long as we can! How can people get in touch with the guild, if they want more information or possibly looking to apply for membership? Best ways are twitter – @kesselguild or on our website. There you can read guild news and also find a link for our guild application. I want to thank No Sleep Till Kessel’s guild leader, Asros. In spite of the extra work for the guild for their server transfer, he found time to make this interview possible. Also a big shout-out to all the members of NSTK, especially Wargard a proud new dad and on Father’s Day weekend! I wish all the guild members nothing but the best in-game and in all they do! 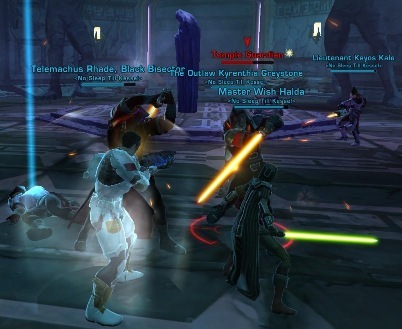 Has your guild recently made a server transfer and is looking for a way to let others know, or does your guild like experiencing the journey of the game with fellow guildmates, or maybe your guild enjoys another aspect of the SWTOR? Why not share it with the rest of the game community? All you need to do is email me at jason@corellianrun.com along with your guild’s website address and we will see if we can get your guild highlighted on Guild Checkpoint at Corellian Run Radio. Operation: Information – Loot Rules My Two Credits: Let the Games Begin – Again!